Definitely, 2015 is getting too busy for Dhanush as the actor has been lining up lots of projects on the full swing. After the worldwind promotions and release of Shamitabh, a week later his ambitious Tamil film Anegan released. Anegan has been getting critical acclaim and has been declared a hit and now, the actor has moved over to Balaji Mohan’s Maari as the film has reached the last schedule will happen until April-May. Soon after wrapping up this project , Dhanush will instantly team up with the blockbuster ‘Velai Illa Pattadhaari’ team. Though the film will not be a sequel to their hit Vellai Illa Pattadhari, the core team of VIP including director Velraj, Dhanush and music composer Anirudh will be working together in it. Following that without any break will commence his other project ‘Soodhadi’ in June. This is a much anticipated film as the most acclaimed National award winning team of ‘Aadukalam’ is coming together again. With so many Tamil projects happening at a rapid rate, Dhanush has signed on the dotted lines for his untitled next in Hindi, directed by Anand L Rai of ‘Raanjhanaa’ fame by end of this year. This will be yet again a romantic film that might have the musical score by Academy award winner A.R. Rahman. He has signed half a dozen commercials with National brands plus he has to look into the workings of his producton company. 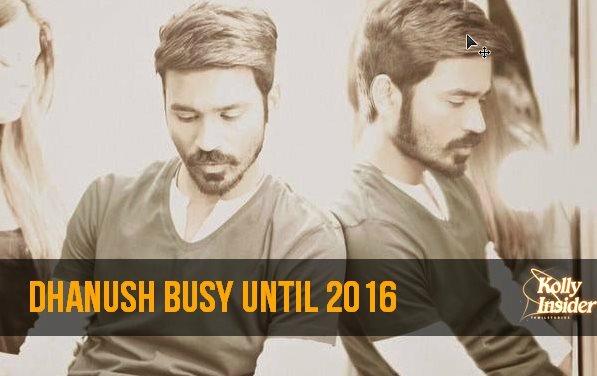 Looks like Dhanush has a super busy till the early 2016. Wish the actor great success in all his future projects and give us blockbuster hits.